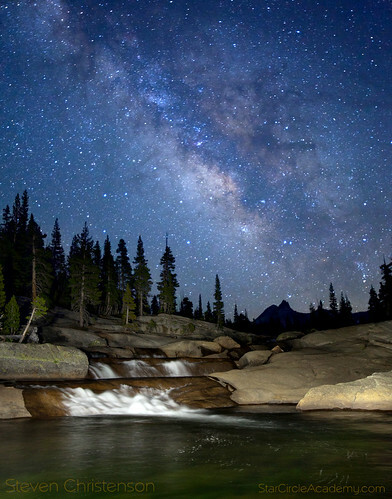 We will capture the glorious Milky Way as stands above a little known, but very pretty waterfall in the Sierra Mountain range – complete with peculiarly peaked mountain summits in the background. This event requires hiking over a fairly level trail for a round trip distance of approximately 2 miles. This location is about a 4 hour drive from the San Francisco Bay Area. We will end shooting at around 11:00 PM. I will only reveal the exact location to yes RSVPs and there is no refund, but it is not too far from Yosemite National Park. Camera, tripod, batteries, memory card. NOTE: The time shown above (if scheduled) is the time the event starts AT the location. Don’t forget to allow for travel time. I regret being cloak and dagger about the exact location, but in the past others have taken advantage of our planning and shown up. Please trust me that weather permitting, your photo will definitely be a “Keeper”. There are no refunds offered unless the Field Event is cancelled or rescheduled. Note the cost is per photographer. A non-photographer or significant other may attend at no additional charge. Hi! Would love to know when and how to sign up for this! Thanks! If you indicate interest in field events on our mailing list, you’ll be notified when we schedule this event. I am intested in doing this! We will be on vacation in Yosmite the first week of August. I would like to know available dates for this field event, to see if it’s happening while we’re there. We’re in the park August 13th-15th I believe. Thanks for your interest. We haven’t scheduled the date yet. If you’ve joined our mailing list you’ll get a notice when we schedule this event, but a quick check of my calendar says it won’t be the dates you’ve listed – the moon is in the wrong phase.